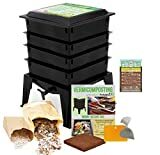 This Worm Factory 360 4 Tray Worm Compost Bin is black and it’s eco friendly being made with post-consumer recycled plastic. It is compact measuring 16-inch x 16-inch x 14-inch which allows you to place it almost anywhere. It features a built in “worm tea” collector tray and spigot for easy draining. Get year round odor free production and you can expand it to 7 trays if you wish.